Politics in America, 2012 Election Edition 10 Edition Explore how government works Politics in America views politics through the lens of competition for resources--who gets what, when, and how. 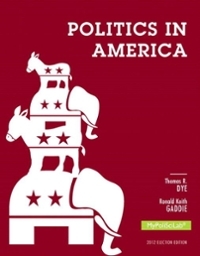 Through this framework, the book examines the foundations, institutions, behaviors, and policies of the American political system. The accessible narrative provides straightforward coverage of American politics and government. The authors encourage students to talk about and think about controversial issues and public affairs surrounding their daily lives. A better teaching and learning experience This program will provide a better teaching and learning experience–for you and your students. Here’s how: Personalize Learning—MyPoliSciLab delivers proven results in helping students succeed, provides engaging experiences that personalize learning, and comes from a trusted partner with educational expertise and a deep commitment to helping students and instructors achieve their goals. Now compatible with BlackBoard. Engage Students—Presents balanced arguments on highly sensitive issues affecting students today to inspire debate and analysis of current events. Improve Critical Thinking— “What Do You Think” features in each chapter ask students to take sides on controversial issues. Learning Objectives open each chapter, giving students a clear learning path through the material. Support Instructors—A full set of supplements, including an Instructor’s Manual, Test Bank, Computerized Test Bank, PowerPoint presentation, and MyPoliSciLab provide instructors with the support they need to teach effectively and efficiently. Note: MyPoliSciLab does not come automatically packaged with this text. To purchase MyPoliSciLab, please visit: www.mypoliscilab.com or you can purchase a ValuePack of the text + MyPoliSciLab (at no additional cost): ValuePack ISBN-10: 0205950108/ ValuePack ISBN-13: 9780205950102.